I wanted the legs and arms to be super tiny in comparison to the body so I used a small hook and a very tight stitch. Also, notice the boots? I used that “ugly” jog in crochet colour change to make the pointy bit at the top of the boot. 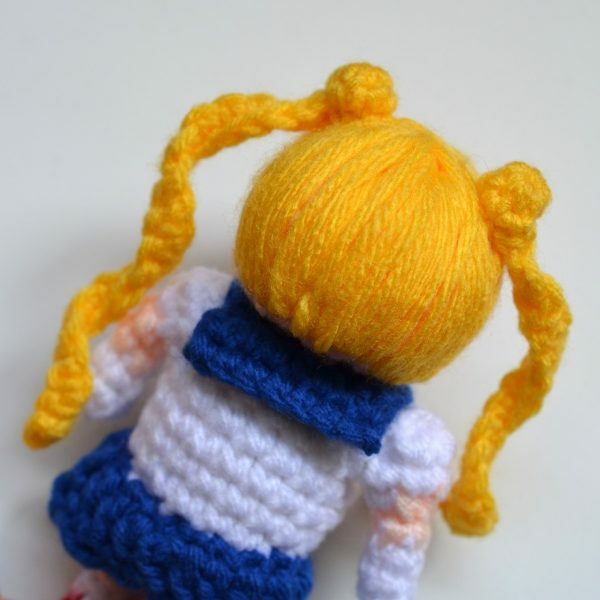 I think my favourite part about this amigurumi is the hair. 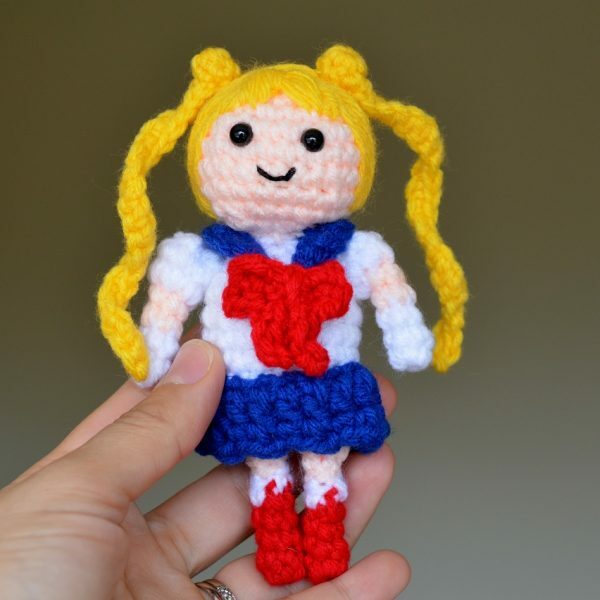 When I first started making Sailor Moon I purposely left the head for last because I was a bit unsure as to how I would get it done. Was my first time adding hair in that style and the buns – or meatballs, as Darien called them – came out better than I expected. Good things learned in this project! PDF version of the pattern can be purchased in my shop. Notes: Unless otherwise stated, this pattern is worked in continuous rounds using stitch markers to locate the beginning/end of a round. Work in somewhat tight stitches. All colour changes start in the stitch of the previous round. Round 1: Start 6 sc in magic ring OR ch 2 and sc 6 in 2nd ch from hook. 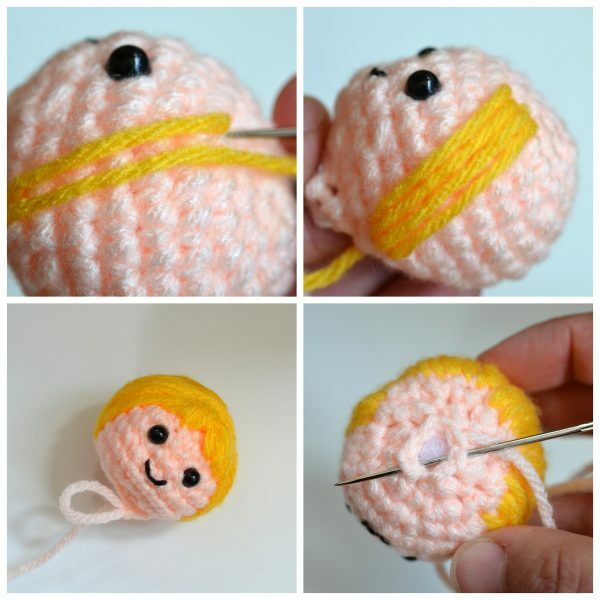 Attach eyes, sew hair with yellow yarn (as pictured), stuff with fiberfill. Fasten off and leave long tail for sewing. To close opening make a few stitches around and pull close like a drawstring purse. Attach head to body last. Round 3: ch 20, sc in 2nd ch from hook and each ch back down to bun, sl st and fasten off. Leave tail to sew. Round 1: Start 5 sc in magic ring OR ch 2 and sc 5 in 2nd ch from hook. Fasten off. Make second leg but do not fasten off. Begin to stuff with fiberfill. Fasten off and sew opening shut (same as head). Ch 20, sl st to first ch to form ring. Ch 3, dc in 3rd ch from hook and around making sure not to twist ring. Sl st to top of starting ch. Ch 2, sc in 2nd ch from hook, ch 2, * sc, ch 2 * around. Switch to peach in last st.
Switch to white in last st. The following increases create the cap sleeves. Fasten off and leave tail for sewing. Sew a few stitches (same as head closure) to give sleeves a more rounded shape. Row 3: Ch 1, sl st, ch 4, sc in 2nd ch from hook and each ch back to base, sl st in next st, ch 4, sc in 2nd ch from hook and each ch back to base, sl st in next st and to end. Fasten off and leave long tail. Wrap yarn in the middle to create bow shape. Row 3: ch 7, sl st in 2nd ch from hook, sc, sc, hdc to end, sl st in next st to end, repeat to make other side. Fasten off and leave long tail. This brings back memories!! 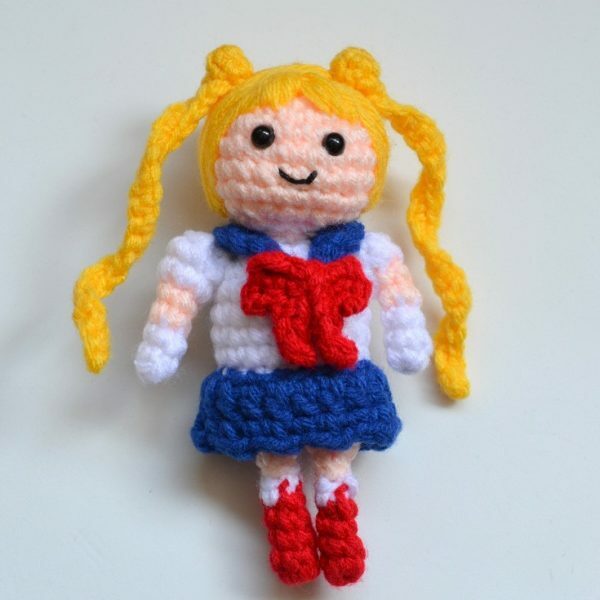 I love sailor moon and the yes, the meatball hair! So cute!